The holiday season is upon us. Hosting a holiday party can feel a bit daunting, but with a little preparation your party will be a big success. It’s never too early to start planning. Here are a few things to help you get started! 1. A date. On the calendar, that is. (I can’t really help you if you need the other kind date.) There are only a few weekends during the “holiday season,” so it’s not too early to get something on people’s calendars. Chances are, a lot of calendars are already getting booked. Which can be considered a strategy. Don’t actually want all your neighbors to show up? Book late and hope most of them already have plans. School nights can be an option, especially if you want people to leave early. Fridays can work as long as you allow enough time for you to get ready for the party. Sunday brunch is an option as well. 2. A plan. You need to decide how many people you want to have or how many you’re comfortable hosting. This decision may have been made for you if you got volunteered for the job and you’re stuck with the guest list. Once you know how many people you’ll have, then you need to decide how you’ll entertain them. Don’t own a dining table? Either stay away from a sit-down dinner and just serve cocktails and hors d’ oeurvres, or figure out how to provide seating for more. We have friends that love to entertain and at one point were living in a townhouse. When they started planning a sit-down Thanksgiving dinner for about 20 people, she went to the lumber store and bought a piece of plywood that she laid over a couple of mismatched tables. With a tablecloth on it, it looked like a large dining room table. Next, you need to decide what you’re comfortable dealing with in terms of preparation and execution. If you really, really want to prepare a 5-course meal, then by all means have a sit-down meal. But if your only experience in entertaining has involved a pizza delivery, then maybe just start with a 5-course meal for four people. Four non-judgmental, supportive and good-humored people. This is a good time to be honest and realistic. Holidays can come with some unavoidable stress, so be honest about whether or not a certain type of party will only serve (pun intended) to frazzle your nerves. If so, don’t do it. I have a pretty basic rule about entertaining. I keep it simple enough so that my sanity and sense of humor never leave the party. At the end of the day, you don’t need perfectly matched dishes, fussy food or a house that looks like it stepped out of a magazine to throw a party that people will enjoy. But, guaranteed, if you’re full of anxiety and not enjoying yourself, no one else will have a very good time either. That song “It’s my party and I’ll cry if I want to” should not be Plan B when you’re throwing a party. 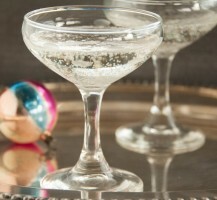 Cocktail parties can be a great option because there is a lot you can do ahead of time. And there are so many good choices for eats that can be purchased ready-made or are relatively easy to serve. 3. A budget. Not all entertaining options are created equal when it comes to budgets. But, throwing a party shouldn’t involve taking a withdrawal from your 401k. Think realistically about how much you want/can spend and go from there and plan accordingly. 4. A tablet of paper. Nothing will help you get ready for your party as much as a good set of checklists. Start with a list of what to do (and it’s okay if the first thing on the list is, Make A List). That’s your to-do list. Then you’ll need a guest list. And a grocery list and a general shopping list for things like cockatail napkins and votive candles. Think of it, write it down. It will keep you from lying awake at 3:00 in the morning trying to commit one of those lists to memory.